This game has been published under the title "Karat" a couple of years ago, and Queen Games has used the recent success of "Alhambra" to publish this game again with beautiful artwork reminiscent of its "sister" game. 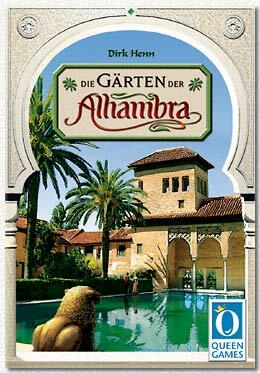 But game wise this has little to do with "Alhambra", in fact "Die Gärten..." is a truly abstract tile laying game. The large game board is filled with empty, semi-octagonal spaces that surround square building spaces of different numerical (VP) value. These buildings are placed at random, but the values are open from the start. Each player now in turn plays one of the octagonal tiles that are designed in a way that 4 of them surround a building space. Each octagon has flowers on each side, in equal quantity, but in different orders. The flowers represent the player's "influence" on the various buildings. If a building is surrounded by 4 octagons it is immediately scored, and the player with the highest number of flowers adjacent to the building wins the points. In the (often occurring) situation that two players have the same amount of flowers present, the player with the next highest number of flowers gets full points, and the others nothing. This can even mean that a player with NO flowers present can get points (if the three other players cancel each other out that is). These are, not even in a nutshell, the complete rules of "Die Gärten der Alhambra". Game play is not as easy, as the board becomes cluttered very quickly, and it is easily overlooked what repercussions each play has. 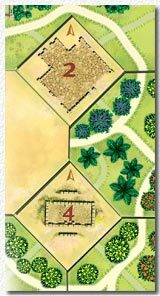 The buildings at the rim of the board are attractive as they can be quickly scored, but these plans are also easily foiled by making playing a matching numbered tile easier. You can have two kinds of tiles in your hand - if you draw a high one you will try to bolster your expected scoring buildings, if you have a low one you might use it to score a building by making a play safe for you but bad for the other players. Rarely you'll have the exact tile that you need or want! The game ends after all tiles have been placed, a running score is tallied and one player wins. The game, although physically attractive, holds one big caveat for the ambitious player, and that lies in the fact that you are "played" by the placement of the other players. In fact up to three quaters of your VP will be achieved through actions no at all your doing!. As each player first of all cares for him/herself, the placement of your own coloured flowers will very often be what you want. However, in which order the OTHER 3 flower colours are placed on the tile and which players will profit from their placement is very often a result of pure chance, even if you might achieve one or two naughty and damaging plays. This is especially true in the endgame, when open spaces become rare and tiles are simply played as they come. In the several games we played the winner was always the player who profited most from this undirected placement, in fact you could have thrown the dice instead of playing the game in a way. But it is probably easy to devise variants. The game offers two: In the first variant each player has three available tiles (which gives your play a bit more of direction), in the second two players play with each having TWO colours. The latter variant can actually be very challenging and can be full heartedly recommended to the pro-gamer, whereas the "normal" game is probably more fit as a "relaxed" family game, for which it's easy rules make it work well. The game can be explained in less than 5 minutes, actual playing time is 45 minutes to an hour.